When you need to find something in the sea of text you’re currently viewing on your Windows 8 tablet, fetch the Charms bar with a finger swipe inward from the screen’s right edge. Then tap the Search icon. The Search pane appears along the screen’s right edge, and a keyboard appears below, ready for you to type what you want to find. The Search icon provides a quick way to find a particular reference in your currently viewed website, a lost e-mail from within your Mail app, or even the forecast for a different city in the Weather app. But Search isn’t restricted to the app you’re currently viewing. By tapping different items on the Search pane, you route your search to cover your entire tablet. Search box: This lets you search what you’re currently viewing. Type what you’re seeking inside this box; then tap Enter. Below the Search box, you often see names of items you’ve searched for previously, letting you retrieve them again with a quick tap. Apps: Choose this to find an app you can’t locate on the Start screen. As you type, a list of matching apps appears onscreen. When you spot your app, launch it with a tap on its name. When you tap Apps, a list of apps you’ve previously sought appears along the bottom of the Search pane, which saves you from having to retype the app’s name. Tap an app’s name, and it launches. Settings: A search in this box looks through every setting found in Windows’ two control panels: the Start screen’s PC Settings area and the more powerful desktop’s Control Panel. Sometimes this search is the only way to find a helpful-but-rarely-used setting that’s hidden deeply in the Control Panel’s crevices. Files: Choose this to search through all the files on your computer, as well as files you’ve stored on SkyDrive, Microsoft’s online storage space. Searching for files turns up songs, videos, documents, and photos, bringing a list of matching names to the forefront. When you spot the one you want, launch it with a tap. 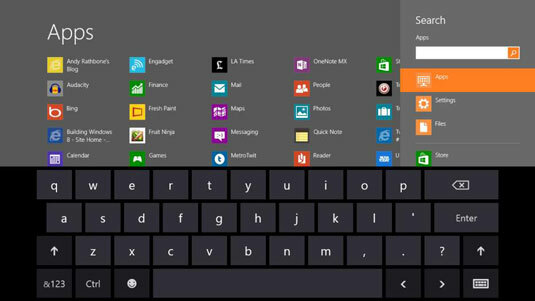 The Start screen’s Search feature works well at finding information quickly and on the fly. To search files on your homegroup — other computers on your home network — choose Files. Then tap the downward-pointing arrow next to the word Files in the screen’s upper-left corner. When the drop-down menu appears, choose Homegroup instead of Files. That routes your search to computers on your home network’s Homegroup. To route a search to the Internet, open Internet Explorer. Then summon the Charms bar, tap the Search icon, and type your search term. When you need more advanced searches — finding files created on a certain date, perhaps — open the Desktop app. Just as with Windows Vista and Windows 7, every desktop folder includes a Search box in its upper-right corner. To fine-tune your searches, tap the Ribbon menu’s Search tab and tap the type of search you need.